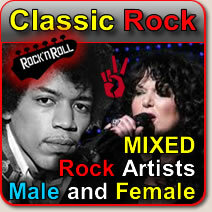 Classic Rock Karaoke music from the 1960s and 1970s - Classic Rock Kareoke songs on CDG Karaoke discs. Classic Rock Karaoke These Classic Rock Songs for Karaoke are from the sixties and early seventies, and include artists and groups like Woodstock Era Groups and artists like the rolling stones, The Beatles, Jimmy Hendrix, Kiss, and Psychedelic Music. It's The End Of The World As We Know It (And I Feel Fine) - - R.E.M.